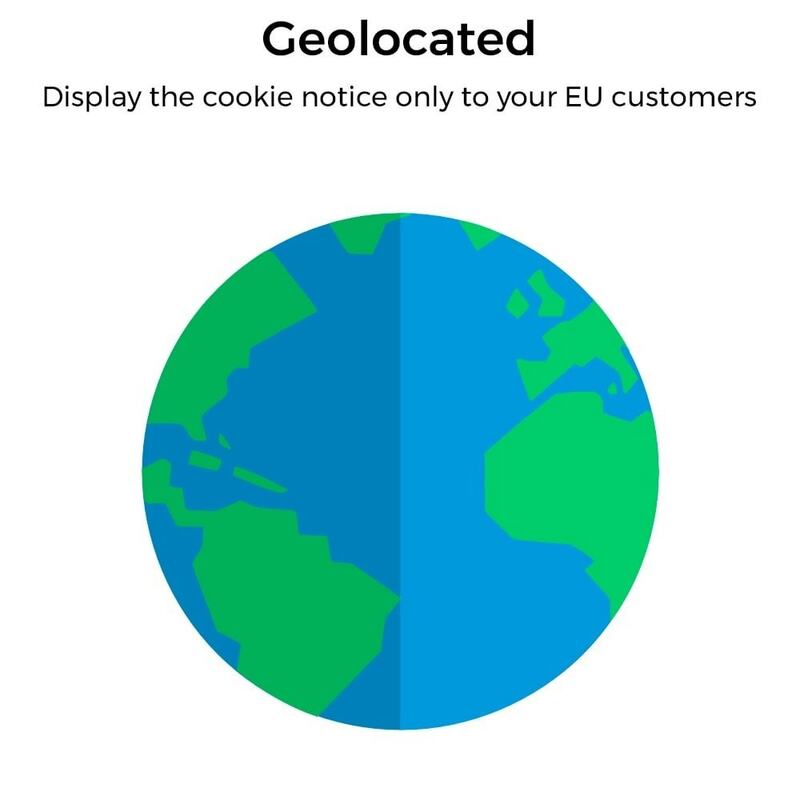 This module allows your store to fully comply with the requirements of the European Cookies Law and the latest changes to the GDPR, blocking the installation of cookies until the user gives their express permission. 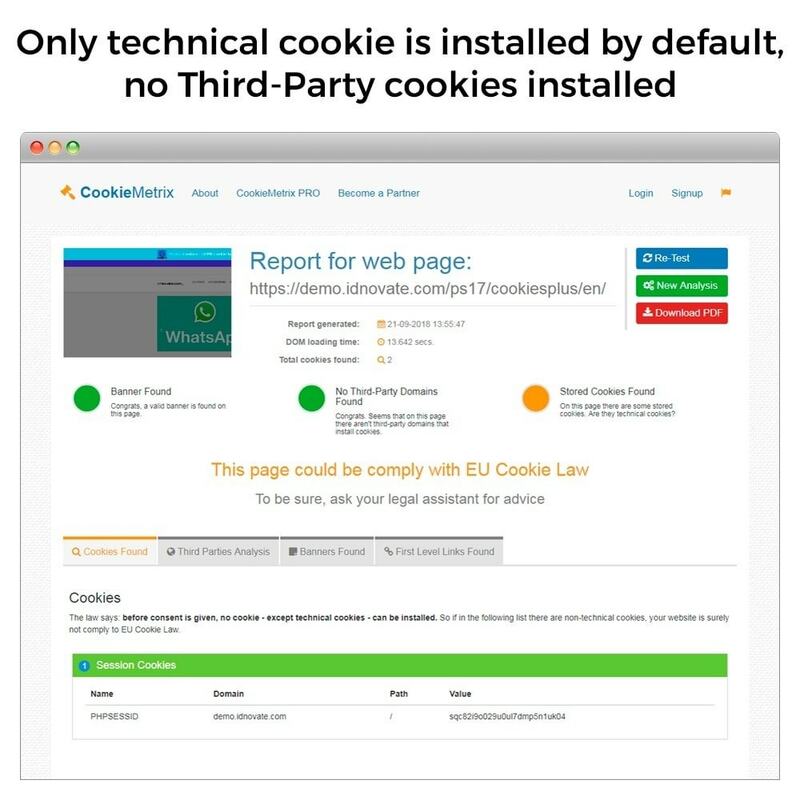 Take into account that the other cookies modules available on Addons, as well as the free ones, only place a warning banner, circumventing the consent of the user and permitting the installation of cookies on the user’s computer before the user gives their consent, meaning they do not comply with the law. The consent should be given through an affirmative and positive option. Rejecting cookies should be a real option. According to the General Data Protection Regulations (GDPR), cookies are considered personal data, which is why the consent should be free, informed, specific and unequivocal. A message that implicitly gives consent is not sufficient. 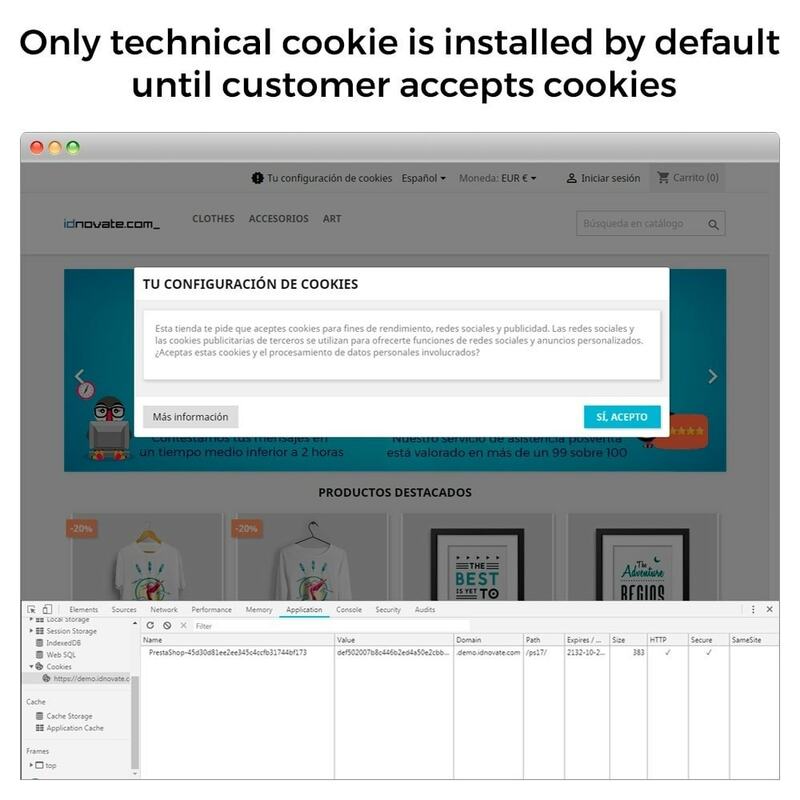 The consent has to be clear, explicit and previous to cookie installation. Unlike the rest of the modules, this one allows you to block the installation of cookies until the client gives their express permission. From the module settings, you can choose which modules install cookies, and the module will automatically block the installation of cookies until the client accepts. 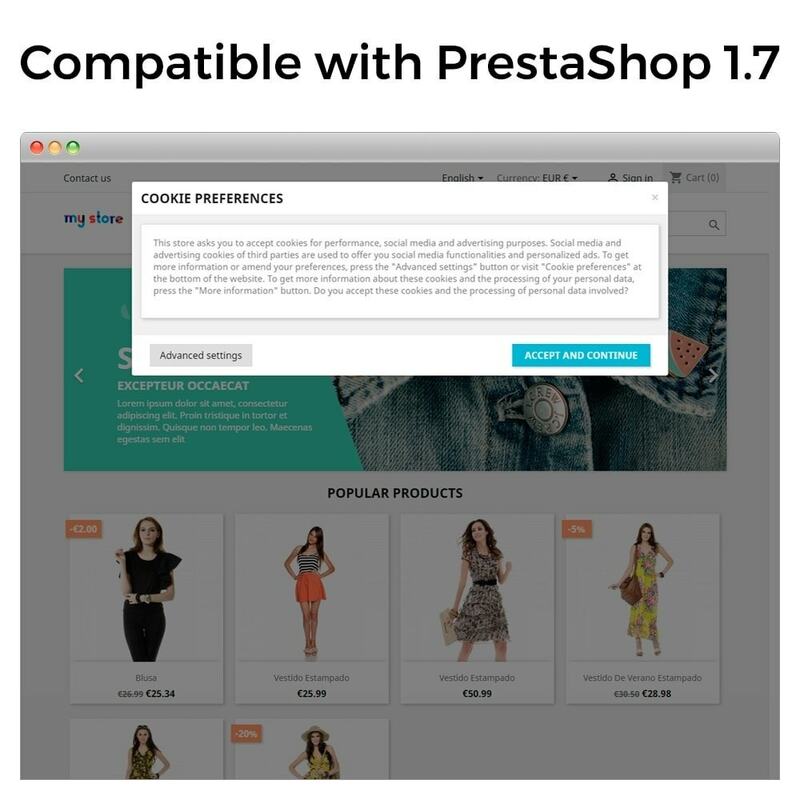 The module includes a link to a service that will help you to identify the cookies your shop uses. The cookies are separated into 2 levels: obligatory and third party. The client can give their consent separately for each of the levels. According to the law, the different types of cookies that the client accepts have to be differentiated. · Obligatory cookies: They provide a secure user login and remember client data (like the shopping trolley), as well as client preferences on the site. They can also be used to avoid services that have already been provided being offered or when they have indicated in the past that they do not wish to use them. This cookies are vital for the correct operation of the shop, which is why they are the only ones installed without the onset of the client. · Third party cookies: These allow for the sharing of pages on social media, the publishing of comments and offering the client advertising in accordance with their interests. They compile information about their navigation habits and online behaviour. To comply with GDPR, it is necessary to block cookies from the monitoring and analytic modules (Google Analytics, Crazy Egg, Hotjar, etc. ), and the social media modules (Facebook, Twitter, Instagram, etc. ), as well as any module that installs cookies. 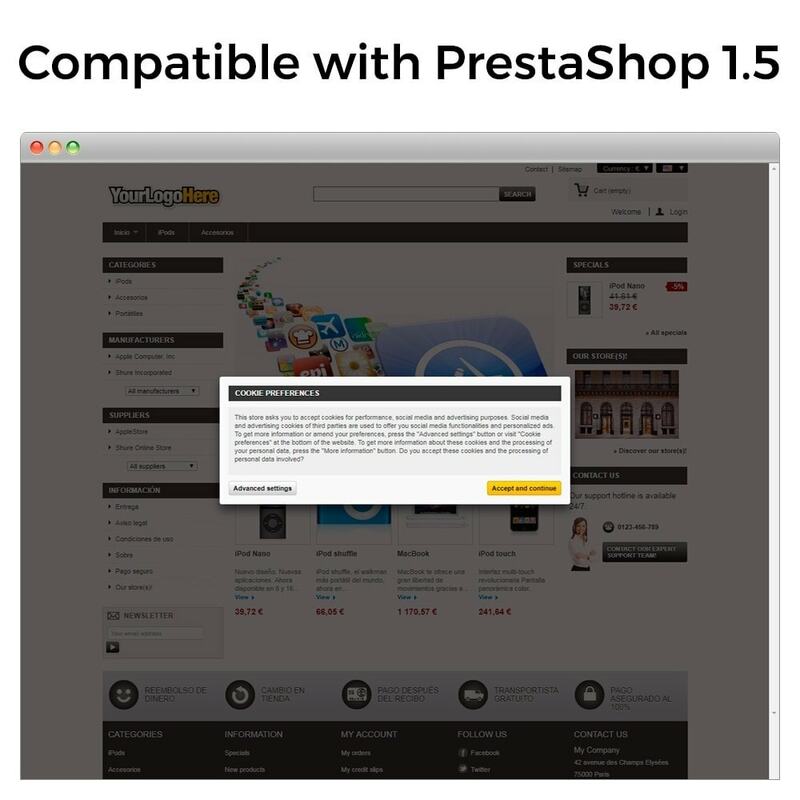 The clients can browse the shop and make purchases with no need to install third-party cookies. On the other hand, the law also specifies that the client has the right to withdraw their consent at any time. The consent should be as easy to withdraw as it is to give. The module adds a link at the bottom of the page and the client account (although you can add the link anywhere on the screen), where the clients have access to their current declaration of consent at any time and can change the parameters or entirely withdraw their consent. At the moment they withdraw their consent, the cookies installed are removed and their consent is requested again. Furthermore, this is the only geo-localization module from Addons. The warning will only appear to your clients in the European Union. It is unnecessary for you to show it to clients that access it from outside the European Union. 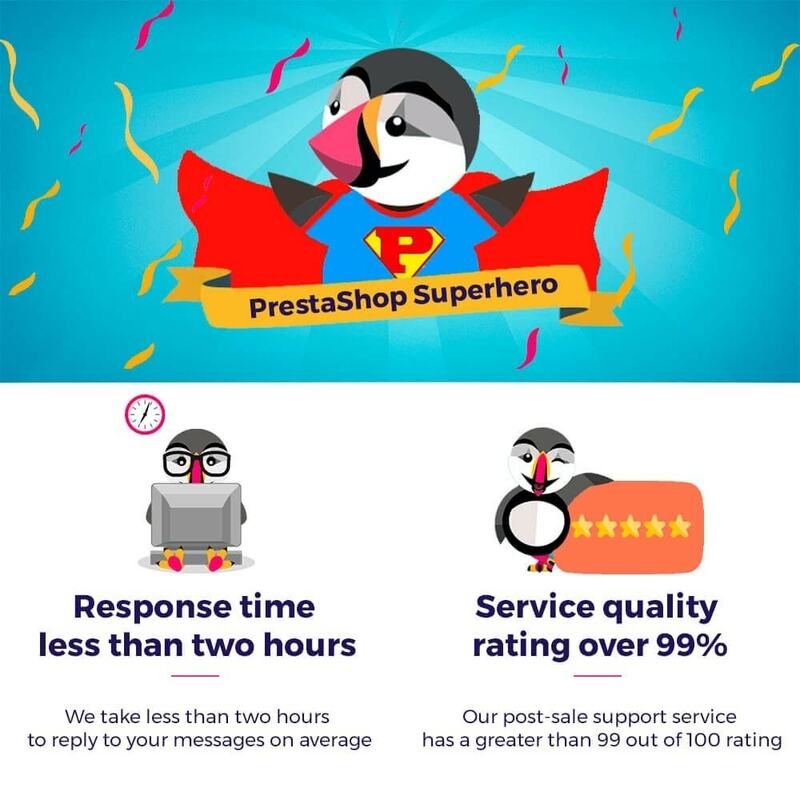 It is necessary to have PrestaShop’s geo-localization activated or have a module with this feature. 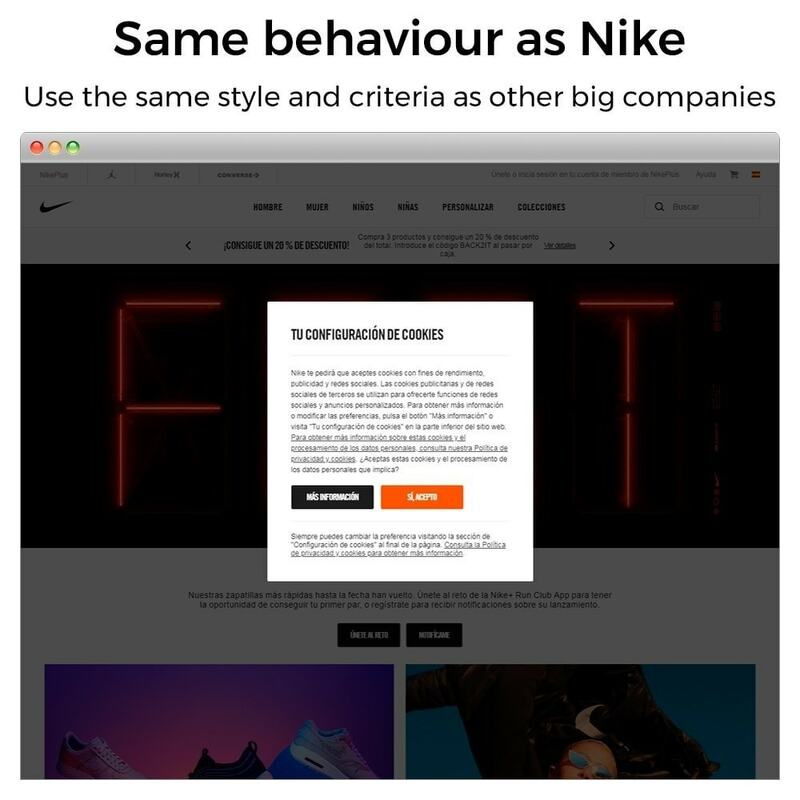 This feature of warning and accepting of cookies is used by shops like IBM and Nike. The module allows for the personalisation of the text that appears in the cookie acceptance warning, in which you can let your clients know which clients you use and why. 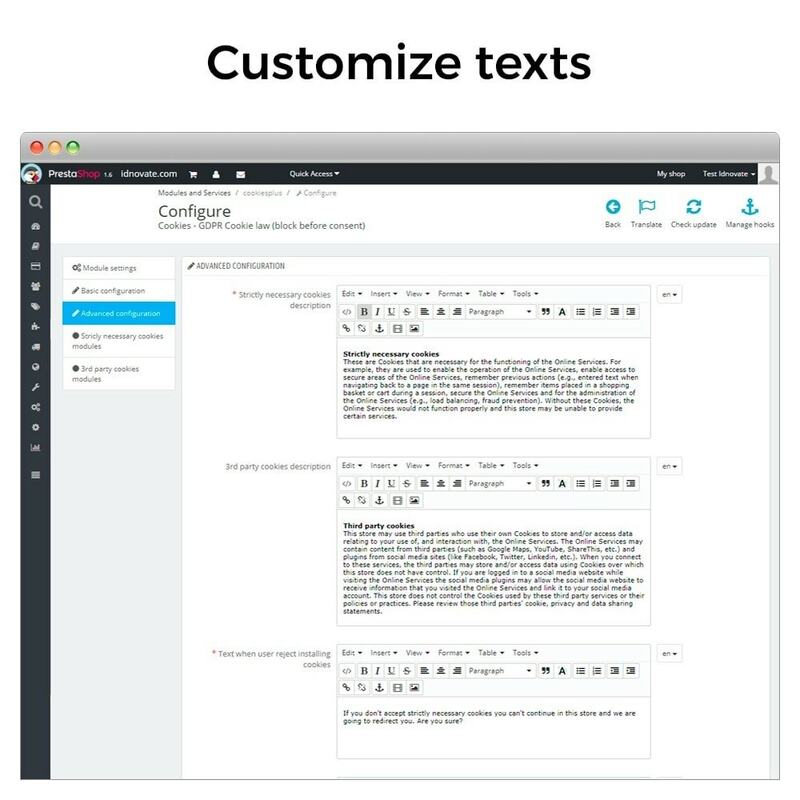 It includes a WYSIWYG editor that allows you to permit the complete personalisation of the content and style and the warning such as the font, colour and size of the letters. All of the texts are translatable into the different languages you have on your shop. You can use the module in all of the shops in your multi-shop, and you can configure each of them differently. 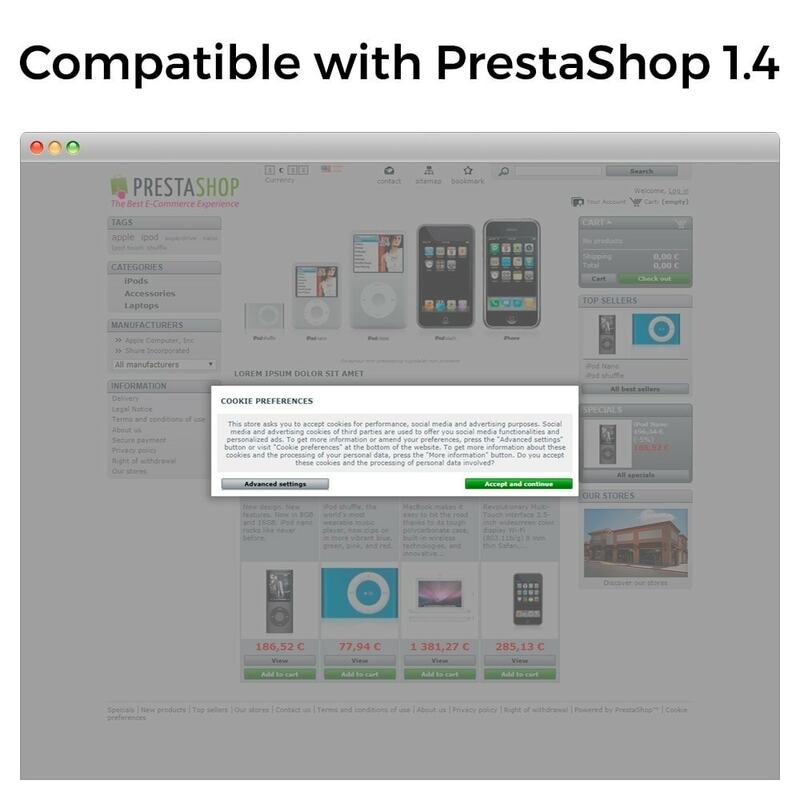 To help you with the configuration and so you can try the module, you can add the IP so that the module is only activated when you use the shop. The module has no negative impact on SEO. When it detects that the page is being consulted by a robot of a search engine, it does not block any module of those configured. 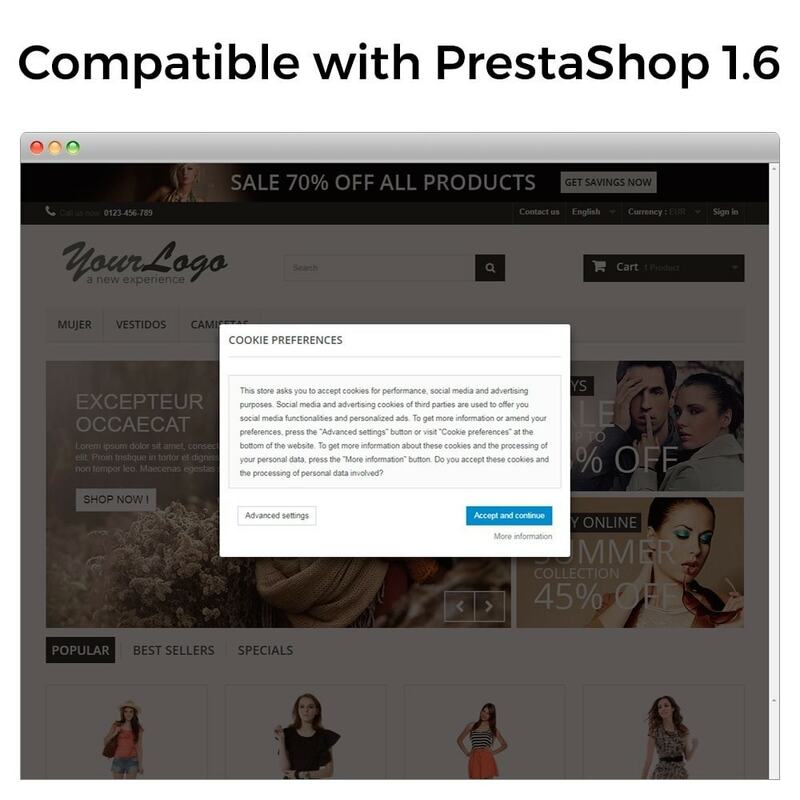 The module includes a link to a service that will help you to identify the cookies your shop uses. What’s more, it will also help you to check if the module is correctly configured. Charge a commission/fee to your customer when they choose cash on delivery/collect on delivery/pay on shipment! The most downloaded payment method. More than 5,000 downloads and highly rated! The favourite payment method for your customers! If you have any questions, or a problem emerges during installation and configuration of the module, send us a message through the “Contact the programmer” option and we will help you.